Drug handling is an important component in drug residue prevention. 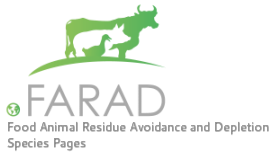 The most common causes of illegal residues in food animals are failure to adhere to recommended withholding period, poor record keeping, and inadvertent administration of the wrong drug or dose. The following pages present important information with regards to understanding drug labeling and administration techniques to help prevent illegal drug residues. Do not inject a larger volume per injection site than stated on the label. Doing so may cause tissue irritation and inflammation causing slow and prolonged drug absorption and lead to violative residues. For suspensions, such as Penicillin G products, prior to drawing up volume to be administered make sure to thoroughly agitate to ensure active ingredient is evenly dispersed throughout the container so volume administered contains appropriate concentration. Giving a medication by a route not specified on the label can cause prolonged and erratic residue depletion. Double check the correct medication is being administered. Many labels and bottles may look similar.